Adam Putnam, the state agriculture commissioner and Republican candidate for governor, is up with his first TV ad of the campaign. 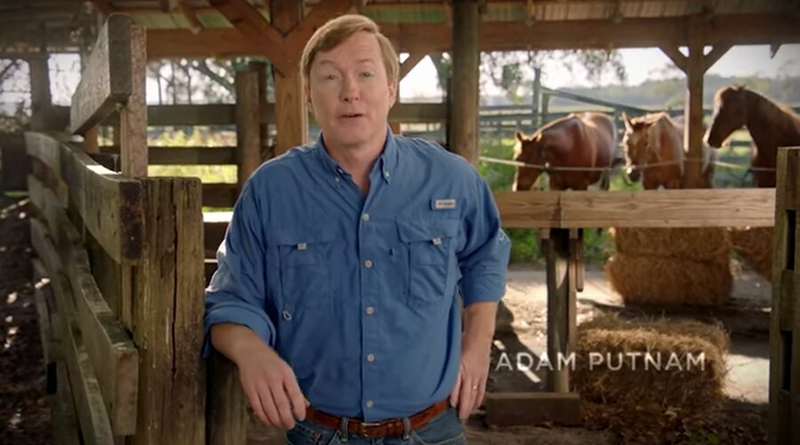 The 60-second spot shows Putnam in a farm setting, wearing a blue denim shirt and blue jeans, and emphasizes his deep Florida roots and his family's ties to agriculture. "I know what it's like to sweat for your paycheck," Putnam says into the camera. "It was here that I learned my faith. Responsibility. Perseverance. Hard work. Today, those values are missing, even looked down on by liberal elites." The second half of the minute-long spot is an excerpt from his speech at the courthouse in Bartow when he announced his candidacy last year. The ad, which was posted to YouTube Monday, is one of multiple versions of a biographical ad that TV viewers will see, the campaign said. Putnam's campaign has placed a one-week ad buy of $627,000, starting Tuesday, on broadcast, cable and satellite TV outlets across the state, according to information provided by advertising agencies. Most of that total, $426,000, was placed in Fort Myers, Jacksonville, Pensacola, Tallahassee, Tampa and West Palm Beach. The statewide primary election is Aug. 28, but voters can start casting mail ballots several weeks earlier.